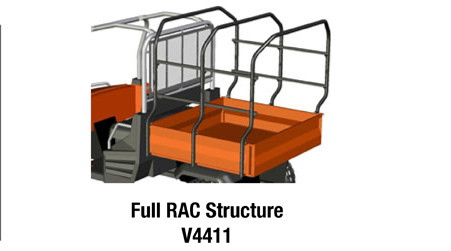 The RTV RAC System is a modular cargo management system developed specifically for the Kubota RTV900 and RTV1100. Configuring the RAC System to suit your needs is a simple 3 step process. The RAC composed of a structure, baskets, and attachments. Configuring the system is a simple 3 step process, starting with the structure as a base, then baskets and finally attachments. The entire system is interchangeable and easily configurable in countless ways. 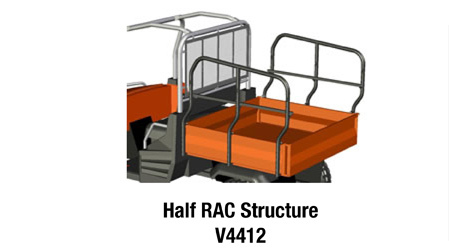 Deciding on a Half or Full RAC structure depends entirely on the amount of baskets and attachments needed. Your decision need not be a permanent one, because the RAC structures are interchangeable by simply replacing the upper portion of the risers by unscrewing a few fasteners. A Half RAC Structure is a medium capacity rack without risers that crossover except for a reinforcement cross member. The Full RAC Structure is a high capacity rack that has more configuration options because of it’s greater height and 3 crossover risers. The Half RAC Structure is a medium capacity rack with no overhead crossover risers with the exception of a reinforcement beam. It’s great for raising the sides of the bed for farmers carrying hay or workers carrying tall items where the overhead structure of a full RAC might get in the way. The Full RAC Structure is a high capacity rack with 3 overhead crossover risers. The Full RAC structure provides increased capacity with more configuration options because of its increased height and crossover risers. Check out the configurations page to see examples of a Full RAC Structure configured. Baskets are configurable in many different ways. 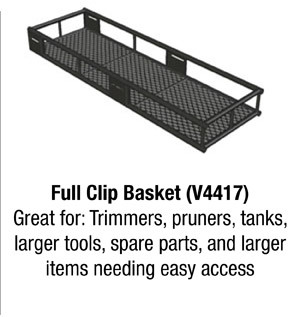 Deciding on the baskets you’ll need depends on the equipment and loads you’ll be carrying. 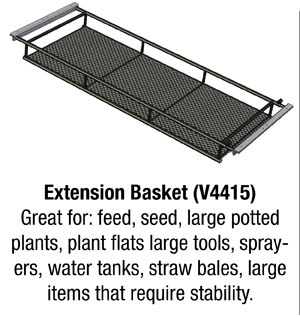 The Extension Baskets are large baskets that can slide back and forth in between the risers. 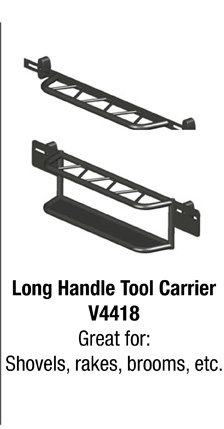 They are great for items with a larger footprint or for carrying large numbers of items. They can be arranged on top of one another to create up to 4 layers of storage (including the cargo box). 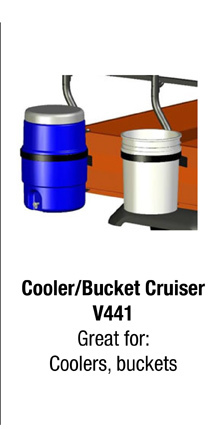 Many owners use them for plants, straw bales, large water tanks, seedling trays, etc. 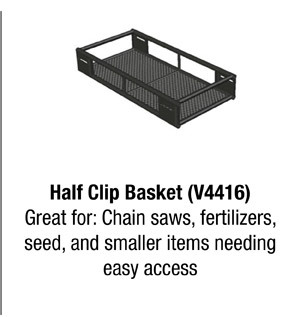 The Clip Baskets attach to the inside and outside of the RAC structure and come in a large Full Clip Basket and a smaller Half Clip Basket. 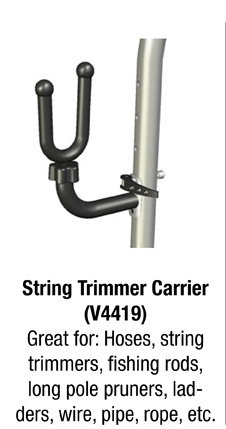 They can be arranged with the attachments vertically and horizontally. They are great for creating a grab and go setup for RTV users who need quick access for quick mobile tasks. 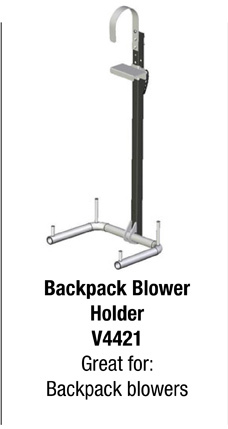 You’ll likely have items that require a more custom solution, such as ladders, rope, hoses, string trimmers, coolers, back pack blowers, rakes or shovels. The attachments to the RAC System can fulfill this need because they are designed for more specific items, but still have a wide range of options. They can be mounted next to each other on the inside or outside of the RTV RAC structure.